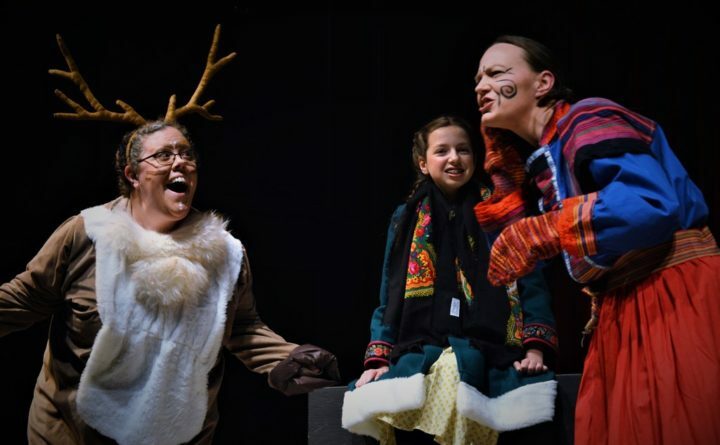 Bjorn the Reindeer (left, Sarah Joy) and Hagatha (right, April Rejman) help Gerda (Gemma Bradney) search for her friend Kai who has been taken by the Snow Queen in Midcoast Actors' Studio's production of "The Snow Queen" at the Crosby Center. A charming production of Hans Christian Andersen’s fairy tale “The Snow Queen” is a wonderful theatrical remedy to the cold weather and chilly relations swirling in Belfast this winter. The Midcoast Actors’ Studio has adapted the story into an hour-long play that emphasizes the value of love and friendship. It features adults and children in a script that mixes tragedy with comedy to give the audience a moral lesson that offers hope for an end to the darkness of winter days. The Snow Queen (Anna Leigh Fultz) puts a spell on Kai (Chris Hayes) in the Midcoast Actors' Studio's production of "The Snow Queen" at the Crosby Center. Director Greg Marsanskis sends most the action downstage but keeps it moving through a number of scene changes. His love of the material comes through and he allows the actors portraying animals to play with the material and each other. Marsanskis’ decision to let Jeff Densmore, a local percussionist, create a score for the show as if it were a movie is what truly set this production apart from others. Densmore gives the actors a beat to follow, foretells some of the action and entertains the audience all at once. Densmore’s music works for “The Snow Queen” the way a fine film score is inseparable from a movie script. Bryan Hayes acts as the shows rhyming narrator. He takes the role so seriously that he wrote his biography for the program in rhyme, but he never resorts to singing his lines. At the center of this tale are best friends and neighbors Gerda and Kai, played by Gemma Bradney and Chris Hayes, respectively. Despite their youth, both are comfortable onstage. Bradney imbues Gerda with a steely determination while still showing the girl’s gentle soul. Even when he falls under the Snow Queen’s spell and rejects Gerda’s friendship, Hayes manages to bring to the surface Kai’s underlying goodness. Anna Leigh Fultz’s Snow Queen never drops her icy facade even when trying to be nice. Fultz’s heavy makeup is visually stunning but tends to obscure her facial expressions, and that’s a shame because the best evil witches give away their intentions on their faces. 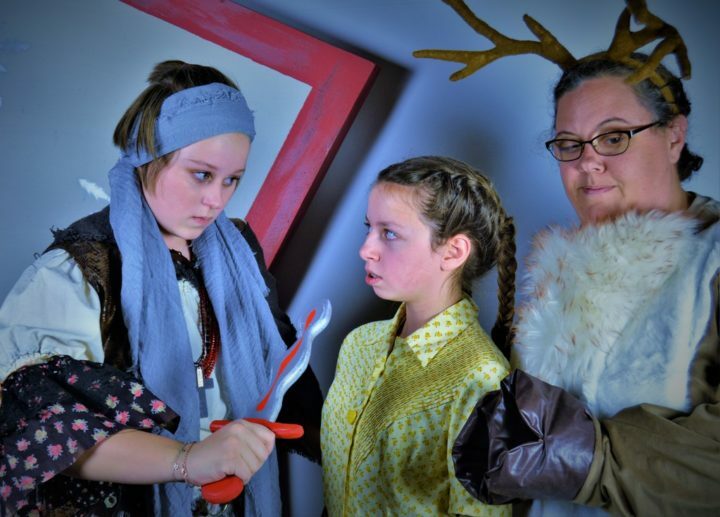 Kaja (Annabelle Lisa) threatens Gerda (Gemma Bradney) with an unusual knife as Bjorn the Reindeer (Sarah Joy) tries to intervene in the Midcoast Actors' Studio's production of "The Snow Queen" at the Crosby Center. The rest of the cast — Sarah Joy, April Rejman and Annabelle Lisa — are equally delightful, especially as the animals that help Gerda locate Kai. The performances are enhanced by Linda Marie’s wonderful costumes and Marsanski’s simple but colorful set. With this season’s productions of “Cabaret,” “The Crucible” and “The Snow Queen,” the Midcoast Actors’ Studio has proven to be one of the most versatile community theater companies in Maine. The group consistently proves it can explore complex subjects and entertain its audiences. While “The Snow Queen” may not be a traditional Christmas show like “A Christmas Carol,” its lesson about the value of friendship, loyalty and light are themes keeping with the season. 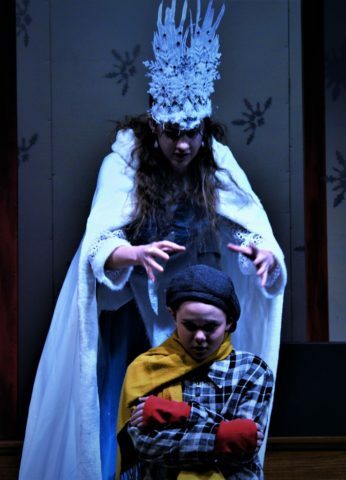 “The Snow Queen” will be performed at 7 p.m. Friday and Saturday and at 3 p.m. Saturday and Sunday at the Crosby Center, 17 Court St., Belfast. For information, call 370-7592 or visit midcoastactors.org.